We’re only one month into 2019 and yet we’re already seeing some big news items in the digital marketing landscape. There are some new tools and features available for paid media experts and SEOs alike that will allow for improved targeted advertising, better acquisition tracking, streamlined approaches to website fixes, and much more. To kick off 2019, Google Ads announced a pair of updates that aim to benefit both consumers and business owners. It starts with a new section within Google Shopping that allows business owners to highlight and present their products to potential buyers with “inspirational and high quality content.” This in turn provides consumers with the information they may need to make a better-informed decision, so everyone wins. 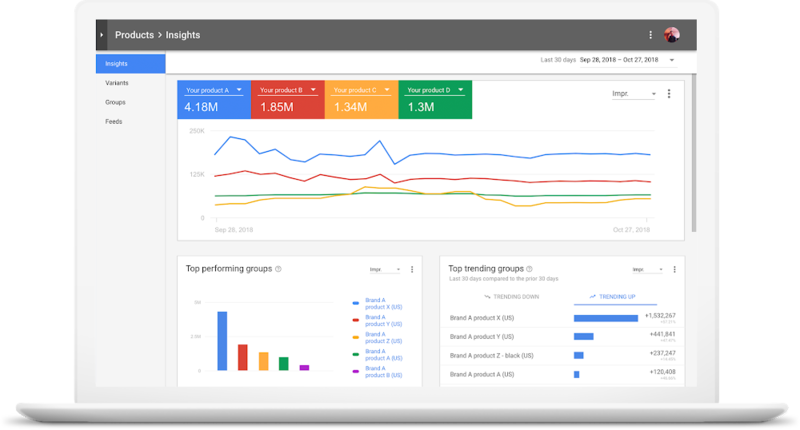 Additionally, Google’s Manufacturer Center now features improved analytics for businesses who want to make better decisions based on data. These updates include performance trends and insights related to product variants, among others. You can learn more about these changes and how they can impact your business at Google’s blog. Advertisers on LinkedIn received another tool for their kit this past month when the platform released the “Interest Targeting” feature within Campaign Manager. Essentially, this feature works exactly how it sounds: advertisers can now target ads to users based on those users’ interests and the topics they have been reading about on LinkedIn. There are more than 200 topics in all that range from customer experience to artificial intelligence, and advertisers can use them to better narrow down their targeting when placing ads on LinkedIn. So far, it’s been a success based on quotes in MarketingLand, with some seeing increases of 25 percent in their click-through rates upon using the new feature. Amazon Advertising revealed a new set of metrics in January that aims to help advertisers using the platform better optimise and measure what they’re calling “new-to-brand” customers. Basically, anyone advertising through display, video, and Sponsored Brands can see if a purchase was made by an existing customer or someone new to the product within the past 12 months. According to Amazon, this will empower advertisers to have a full grasp on how much it costs in advertising dollars to acquire a new customer. It will also show which tactics and channels are the most efficient so advertisers can spend their money more wisely in the right places. After previously only offering them to select users, Google has opened up its 15-second non-skippable video ads to all advertisers running auction campaigns. This is a marked changed from the way it worked in the past, when you either had to buy them through the premium Google Preferred network or YouTube’s reservation process. This is obviously great news for advertisers, and it’s a change that won’t necessarily impact users in a negative way. Of course, they’ll have to sit through some additional video ads in terms of running time, but Google says they’re maintaining the cap on the number of these ads that users can be served. Google searches aren’t typically one-and-done scenarios. Whether you’re looking for recipes to start eating healthier or researching a new product to buy, it’s common that you’d head back to Google hours or even days later with similar queries. Well, the folks behind the search engine have taken notice and rolled out new activity cards on mobile and the app in the U.S. to start. Users can now pick up where they last left off and see past related search results and viewed pages. Additionally, you can save links for later if you’d like and delete the ones you don’t need anymore. You can learn more about the activity cards at Google. Before Google revealed its updated Rich Results Test tool this past month, webmasters basically had to the play the trial-and-error game when trying to optimise their pages for appearing in the SERPs with something other than the standard blue link. Many times, this means trying to get the coveted “position zero” of the featured snippet, and others it means having ratings, carousel features, and the like within the results. But with this revamped tool, webmasters can avoid the trial-and-error approach by seeing how changes to their code will appear in real time. Google released the update with a recipe result that webmasters could tinker with, and you can also just go ahead and mess around with the Rich Results Test for yourself (if it applies to your site or page, of course!). In a month already full of updates and new features, we have yet another one to experiment with and use as part of Google Search Console. The latest version of the URL Inspection Tool makes it a versatile feature that can provide SEOs and webmasters with vital information, all from a single page. The digital marketing team at Stone Temple has performed a study every year since 2016 to determine whether or not links are an important ranking factor in Google. And each time they have released an updated version of the study, the conclusion has remained similar: yes, links are indeed still important. To paraphrase ST’s founder, the key takeaway here is that every aspect of running a website, from the copy to the user experience to the SEO and everything in between, needs to be as good as it possibly can. Once those efforts are in place, webmasters can begin to garner links and see their benefits. If an unnatural link(s) appears on your website, it’s up to you to take care of it to avoid a potential penalty from Google. At least, that’s the word according to the company’s own John Mueller, who was brought into a Twitter discussion about unnatural links potentially being placed by AI or bad actors. Specifically, the user asked him, “What will be Google’s stance on unnatural links when AI is automatically selecting links for partially AI-based articles?” Mueller made it clear that whether it’s AI or some random internet user, Google’s answer is the same: it’s the webmaster’s responsibility to clean up any messes.